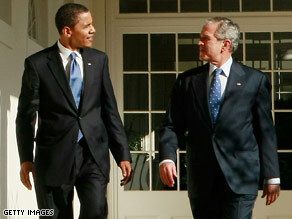 President-elect Barack Obama may overturn many of the executive orders that President Bush implemented. WASHINGTON (CNN) - President-elect Barack Obama could reverse some of President Bush's most controversial executive orders, including restrictions on embryonic stem cell research, shortly after taking office in January. Two other executive orders from Bush - one dealing with a so-called "gag" order on international aid organizations regarding abortion, the other with oil and gas drilling on federal lands - also are receiving increased scrutiny. Obama's transition team is reviewing hundreds of Bush's executive orders, according to John Podesta, Obama's transition co-chair. "Much of what a president does, he really has to do with the Congress - for example, budgeting, legislation on policy - but executive actions are ones where the president can act alone," said Martha Kumar of the White House Transition Project, a nonpartisan group established to help new presidential administrations.